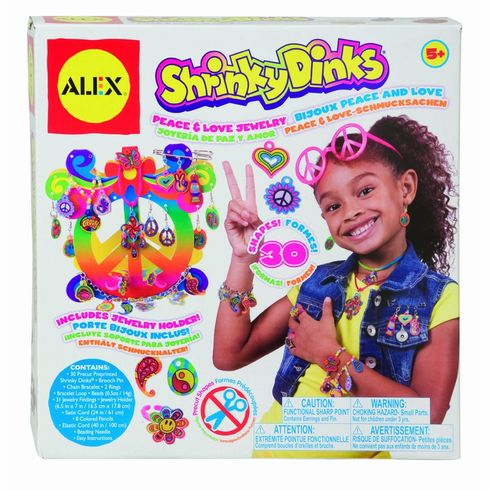 Make groovy bracelets, earrings, necklaces, rings and a brooch with 30 precut Shrinky Dinks shapes. Display on a peace sign jewelry holder! Includes 30 precut Shrinky Dinks shapes, 8 colored pencils, beads, chain bracelet, 6 earrings hooks, brooch pins, 25 jewelry findings, 2 rings, stretchy loop, satin and elastic cord, jewelry holder, beading needle and easy instructions. Ages 5 and up.